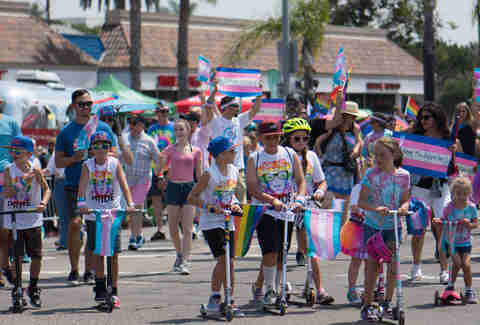 San Diego’s Pride Parade attracts more than 200,000 attendees and participants, and navigating your way through it all can be challenging. 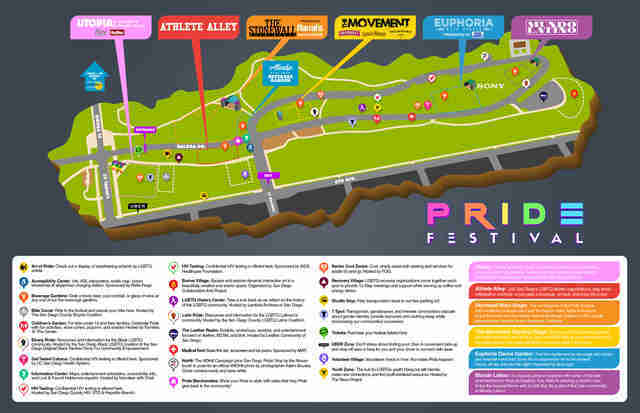 Use our handy guide for all the relevant details, and have a safe, fabulous, Pride-filled weekend! Driving and parking in Hillcrest is notoriously difficult, and the expected hordes of revelers aren’t going to make it any easier; walk, bike, or use public transportation if possible. Check the MTS schedule for the best route to the parade, using University Avenue and Normal Street as your destination. Above all, allow yourself plenty of time so you don’t miss a minute of the festivities! 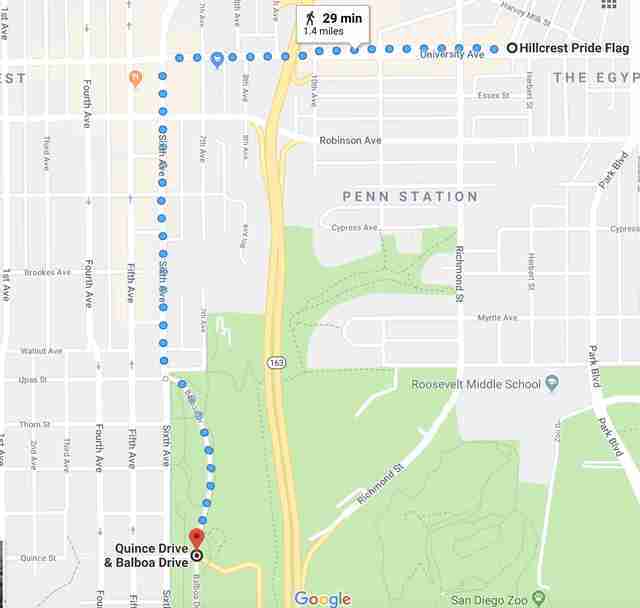 If you absolutely have to drive, San Diego Pride has set up a free parking and shuttle service to and from the Pride Parade and the Pride Festival at the Old Naval Hospital at Park Boulevard and President’s Way. To the Pride Parade: Free shuttles run round trip to the Pride Parade from 8am till 3pm on Saturday, July 14th, dropping parade attendees off at Essex and Richmond Street, one block south of University Avenue. To the Pride Festival: Free shuttles run round trip to the Pride Festival from 8am till 10pm on both Saturday, July 14th and Sunday, July 15th, dropping festival attendees off at Sixth Avenue and Juniper Street. A free express shuttle will take you from the Pride Parade to the Pride Festival from 12pm till 4pm on Saturday; catch it at Essex and Richmond Streets. Cyclists can store their bicycles safely at the bike corral located just outside the Pride Festival at Sixth Avenue. Saturday's street closures will begin at 6am, and remain in place until 4pm. A complete listing of road closures on Friday, July 13th and Saturday, July 14th can be found here; scroll down to the purple section. Also, note the No Parking Zones in the orange section. Nothing ruins a good party like walking back to your car and seeing a parking ticket! Expect partly sunny weather on Saturday and Sunday, with highs in the upper 70s and lows in the high 60s -- solid parade weather, in other words. This is San Diego, after all. Are the events ADA accessible? 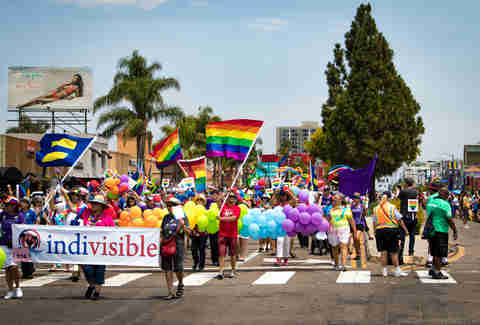 San Diego Pride has an array of resources to ensure that everyone has a amazing experience, including: accessible seating, American Sign Language interpreters, and, at the Pride Festival, cool zones for seniors and service animals. ADA Accessible Vans will be available at any Pride (Festival, Parade, Parking) Shuttle stop on Saturday, July 14 from 8am to 12 midnight and Sunday, July 15 from 8am to 10pm. Contact the Pride Volunteer at the Shuttle stop to hail an ADA Accessible van. There’s decent viewing from the sidewalks along most of the parade route, but if you’re early enough, try to snag a seat in one of the six reviewing stands at University Avenue and Normal Street, University and Vermont, University between 6th and 7th, 6th Avenue (near Robinson), 6th and Pennsylvania, and 6th and Ivy Lane. When and where is the Stonewall Rally? The Spirit of Stonewall Rally takes place on Friday, July 13 at 6pm under the Hillcrest Pride Flag. Speakers include Christine Kehoe, San Diego County’s first openly LGBTQ elected official; Sakeenah Gallard, founder of SPEAAQ Inc., which focuses on helping victims of sexual violence speak out; Liat Wexler, who co-founded GenderQueer San Diego, the first non-binary group in the region; and keynote speaker Danica Roem, the first openly transgender woman elected to a state legislature. What’s the Pride Festival and how do I get in on it? San Diego’s Pride Festival takes place on Saturday, July 14th from 12pm till 10pm, and Sunday, July 15th from 11am till 9pm at Marston Point in Balboa Park at 6th Avenue and Laurel Street. Imagine a dance party with four amazing stages, over one hundred entertainers, fabulous food, inspiring art, exhibits, cultural presentations, and vendor booths. Headliners this year include TLC and JoJo. Add 40,000 of your new best friends and mix thoroughly for the Pride event of the summer! Tickets range from $20 for a one-day pass to $400, depending on your level of VIPness. Where can I keep the party going? Much of San Diego’s queer nightlife is centered in the Hillcrest neighborhood, with enclaves in North Park and University Heights. Local favorites include Spin, an enormous nightclub in a converted warehouse; Martinis Above Fourth, a swanky, elegant club with huge, award winning martinis; Eagle, for those who enjoy a bit of leather with their nightlife; The Rail (formerly the Brass Rail), San Diego’s oldest gay bar; and Gossip Grill, a Nicky Award-winning women’s bar where everyone is welcome. How else can I show support? 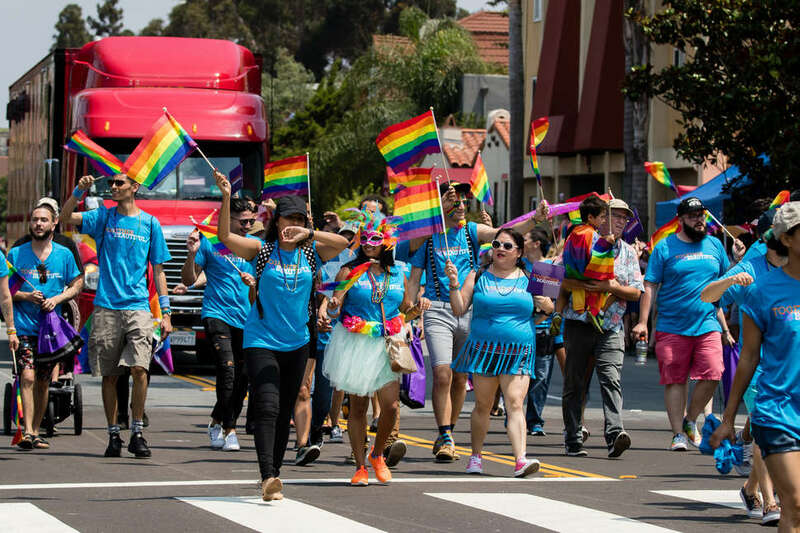 San Diego Pride depends on over 1000 volunteers to plan and implement the Pride festivals, parades, and events, and with more than thirty different volunteer departments, you’re sure to find one that’s a good fit. You can donate at any time, knowing that 84 cents of every dollar goes to education, advocacy, and civic organization. Most importantly, register and vote! Your voice is needed now more than ever.